(OCTOBER 17, 2018) Hydro-Gear unveiled a new transaxle for zero-turn mowers, the ZT-3800™, at the GIE+EXPO in Louisville, Kentucky. The ZT-ZT-3800™ series transaxle is available with two unique offerings including a model with an internal expansion tank or an option for an external oil cooler. 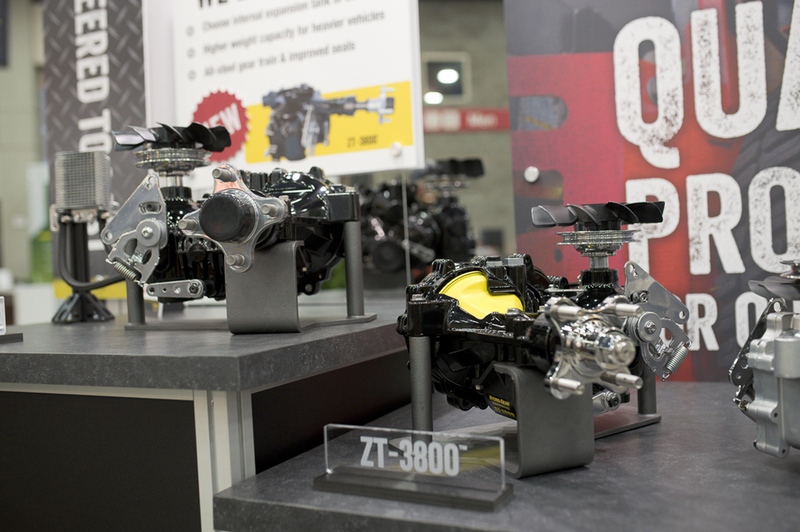 "We are very excited to bring the ZT-3800™ to market and see our high-performance transaxles driving our customer's vehicles," said Mike McCoy, Vice President of Sales & Marketing at Hydro-Gear. The ZT-3800™ offers our customers what they've asked for; higher weight capacity with a common frame mounted design, reduced leakage points, and improved heat stabilization in our reliable commercial drive systems." The ZT-3800™ features an all-steel gear train, a treated motor block, a larger charge pump, and upgraded axle bearing to handle heavier vehicles. The internal expansion tank models allow mower manufacturers to assemble vehicles more efficiently with reduced parts resulting in fewer leak points. The ZT-3800™ with an oil cooler provides lower operating temperatures for drivetrain longevity. At the GIE+EXPO, Hydro-Gear also introduced updates to existing models like the T3-HD™ with full-locking manual differential and a new oil service kit for select transaxle options. In addition to revealing new products, Hydro-Gear gave attendees an opportunity to operate a mower simulator to experience new electronic technology. Hydro-Gear's trade show presence also included an outdoor demonstration area with several mowers on display from various OEM's including Hustler, Bob-Cat, Bad Boy, Dixie Chopper, and an all-electric model from Mean Green among others. In the outdoor demonstration area, customers had the opportunity to test-drive a Scag Patriot mower equipped with Smartec ZT-3400 transaxles which provide operators with drive-by-wire technology. This new product allows operators to make adjustments to the drive system, provide additional safety features, and enhanced performance with features such as "Straight Line Tracking." "Hydro-Gear is launching several new products into the OPE industry and also some cutting-edge technology that is sure to change the industry as we know it," said Scott Wilmoth, Marketing Manager. "We continue to lead the industry with our reliable products, excellent customer service, and relentless drive towards innovation. I'm very excited for the future of Hydro-Gear and our industry as a whole."